Actually speaking there should have been 2 titles for this very post. First : Buffer for Facebook is Live. Second : Buffer & It’s Extensions get a redesign or UI update. But I tried to combine both those titles into one and you can see the result. On 8th November the much awaited Buffer for Facebook was launched. And I must admit that I was really waiting for this moment from the time Buffer was unveiled. The reason for this kind of restless-ness was because of the activity you get in Facebook for a single update. But I wasn’t alone in this restless behavior as 102 other Buffer users also wanted this feature. Proof is the Uservoice forum of Buffer. We have to sincerely thank the Buffer guys for bringing this feature on as soon as they possibly could. The Buffer blog in a post says that credit for this app goes to the new member of Team Buffer, @TomMoor. It may seem easy to imagine or talk about implementing a system for varied social networks. But trust me, it isn’t. Each Social Network offers APIs which are different in nature and functionality from the other. 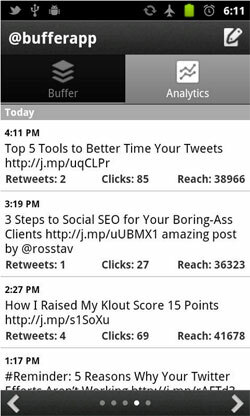 So if you think when they can bring Buffer for Twitter then why not immediately launch it for Facebook, LinkedIN and others; then you are wrong. To start with it’s not very different from Buffering a tweet. Even then, I don’t mind doing a 5 point tutorial. So let’s start with it. Log-in to your Buffer Dashboard and hit the ADD button present next to your already connected Twitter profile(s). Hit the Connect Facebook button on the hovered box. After a few seconds the hovered box will show your main Facebook profile along with the Pages and Applications you Administrate. 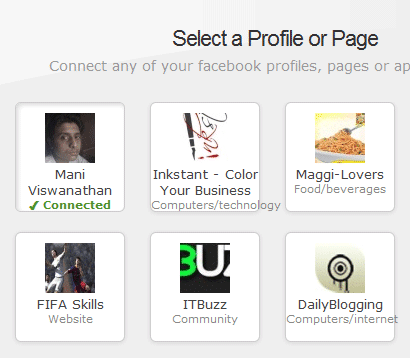 Now Select any one of profiles,pages & apps. Since the Free version of Buffer allows you to add only one profile from each Social Network you’ll need to upgrade to better plans if you need it for your business pages. After the entire process is done, the Dashboard will be displayed automatically with the Facebook profile/page tab added to it. Just write the desired status or hit the Inspire Me button to compose an Update suggested by Buffer users. The important thing here is to deselect your twitter profile and select the new Facebook profile(*) you added. Now hit the Add to Buffer button. That’s as simple as I could explain. * Remember you can make your Facebook profile as the default tab in the Settings page. Bug:- The Thumbnail for your blog links will change once it’s posted. That’s a bug which the Buffer team has been alerted of and it will be fixed very soon. I don’t think there is a need to write a lot here as the below image will communicate better. I know this isn’t that related to this post. But since it’s a Buffer app I thought including this information will prove useful for Android users. 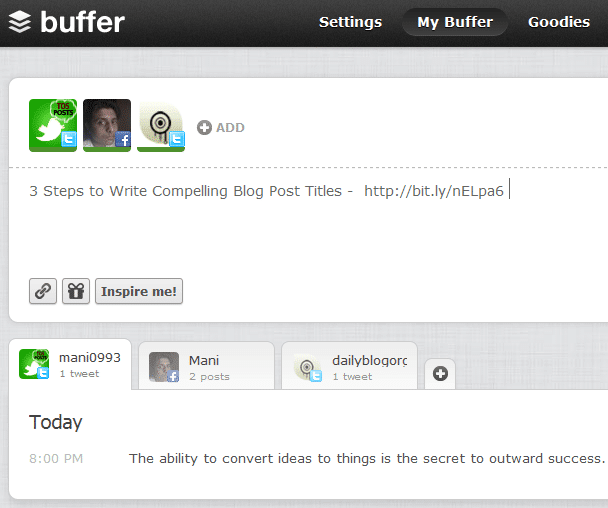 Buffer 2.0 was unveiled late last month. This updated Android app comes with an improved UI as compared to the previous version and a better Analytics tab is added to the dashboard as well. It looks very similar to the Desktop/Web version of Buffer. @sermao has built and designed the app. So due credits to her. We can’t afford to miss the founders of Buffer, Can we ? Absolutely not. So Joel and Leo deserve a special mention here for the awesome work they have done on this tool. What do you think about Buffer at this point of time ? Have you started using it or planning to do that very soon ?? Thanks for this Detailed Tutorial. I will try this Buffer for Facebook. Thanks for such a wonderful article! It helped me a lot in improving my knowledge. Thanks for this info it is looking like good one and i hope it will be work like buffer voice. not little buffer.its work well better then others.its really very nice for me.i think its also work for you. This does look like a great program I just went over and signed up. I will have to play around with it a bit but I really like the dashboard and it functionality. I really do like the new options available form Facebook, while they still have kinks to work out they are moving in the right direction. Thank you for sharing with us a simple yet complete tutorial on how to use buffer for facebook. Will try it out then!